It looks like the Pacific Northwest is at it again with it’s ridiculous sunsets and over bearing sunlit rocks and beaches. The only thing that would have made last week even more over the top is if there were a pod of whales breaching in the surf. Sometimes I can get a little overwhelmed with the incredible sunsets at Cannon Beach and last week was no exception. You couldn’t have taken a bad photo even if you had tried. The clouds helped create another nuclear like explosion with the sand and rocks creating one of the most epic canvases. I decided to post this photo in order to show the personality of the swirling sea foam in the foreground. I normally avoid getting these types of shots but the sea foam was really dancing along the beaches this night. It literally looks like a snake slithering back towards the surf. The glare from the sun really caused an epic color display with each part of the photo showing a different color. I initially thought that the clouds in the distance were going to ruin my sunset shots but I was amazed at just how many colors they produced. Early spring can really be unpredictable but it can also produce some amazing photo opportunities. It’s hard to imagine but the sun was directly behind the largest of the Needles rock and I ended up using it as a buffer most of the night. It pretty much allowed me to take photos that are normally filled with too much glare. In fact, I usually have to wait until later but since the sun wasn’t as intense and the clouds were subduing the sun, I was able to get some really unique photo opportunities. It also helped to have a flawless sandy beach with a very low tide. If you’re wanting too get some really awesome sunset shots, I would highly recommend that you allow a few days to visit the Oregon coast in order to take advantage of the amazing weather that you could be enjoying. Again, you just want to make sure and bring your tripod, bubble level and remote switch. It’s also pretty cold during sunset so you may want to bring a warm hat and maybe even a thin pair of gloves. I was really surprised at how cold it got and how quickly the temperatures cooled off once the sun set. If you are ever interested in getting a beautiful and unexpected sunset shot along the Oregon Coast, I would recommend that you visit during a time when the weather is stormy and unpredictable. You can almost always expect the weather, along the Oregon coast, to be unpredictable but you can never be sure what to expect. The summer months are the most predictable unless the fog stays enough offshore that you aren’t able to get a good sunset shot. This is usually the only thing that you will ruin your shots. However, if they are predicting stormy weather, you can have a much better chance of being surprised by some crazy sunset opportunities. It’s important that you closely watch the weather predictions and then adjust for the chance that they will get it completely wrong. However, if you’re wanting to get some crazy sunset weather, you don’t really need to check the weather unless you want to be sure and pack the right clothes. I find that rainy and stormy weather offers photographers the chance to really step up their game and allows you to really step out of the box. I try not to be a storm chaser but rather choose a location that will create the best canvas for some stormy weather shots. Utilizing rocks, sand and trees can really enhance your photo and if you can include the clouds and sun, you really have a winning shot. I took this shot and it shows how I took advantage of the offshore rocks, beach, clouds and sun cutting through the clouds. To get this shot I set the camera mode to shutter priority and set the speed at 10 seconds. I wanted to get the movement of the clouds and make the ocean look frothy. You can’t really see the beach but it’s in the foreground and the beach is made of medium sized black rocks. I attached my CIR-PL, warming filter and ND filter in order to increase the shutter speed and not have too much glare from the sun. I also wanted to capture the reflection of the sun beaming off the frothy ocean in order to create a biblical type of photo. I also set the ISO at 100 and put the white balance at +1. I was using my Sigma 17-70mm lens and set the focal length at 55mm. [/caption] A very stormy and cold winter sunset along the Oregon Coast. One of my first expeditions to the Oregon Coast, to capture the sunset, during Winter turned out to be one of my most memorable experiences. It didn’t help that the roads were icy and I had to drive over 4 hours round trip even though there was no more than 11 hours of light during the entire day. However, I had decided that I wanted to try and capture the perfect winter sunset with everything that an Oregon winter can offer. I made sure to bring along most of my snow-shoe gear so I wouldn’t have to suffer from the 34 degree temperatures and howling winds that made the temperatures drop into the teens. Even though my time allowed to photograph the scenery was limited, due to the shortened season, I was able to get this photo. The sun was actually dancing around some very fast moving and very aggressive clouds and it almost seemed that they were having a power struggle with each other. I was looking to get this exact shot of the sun just peeking from the cliffs with the clouds painted in an orange glow with the waves crashing against the rocks. The surf is also glowing in the turbulent and frothy salt water and the suns rays are spreading out along the entire sky. To get this shot, I made sure to set up my tripod, remote switch and bubble level in order to avoid any camera shake or blur. I also attached my ND4, CIR-PL and warming filter. I kept the camera mode in Program in order to avoid any blur from the water or clouds since I didn’t want to lose the personality of the swells. The shutter speed ended up at 1/6 second and the aperture was at F-4.5. I set the ISO at 100 and the white balance at 0 since the light was pretty dark due to the low light and time of day. This photo was taken just a few miles from Oceanside, Oregon, along a very secluded but easily found beach. [/caption] Beautiful sunset in Cannon Beach, Oregon with the Needles and low tide! September offers some of the most amazing sunset opportunities along the Oregon coast since the air quality is less than ideal due to the several wild fires that rage in the Cascade mountains during late summer. 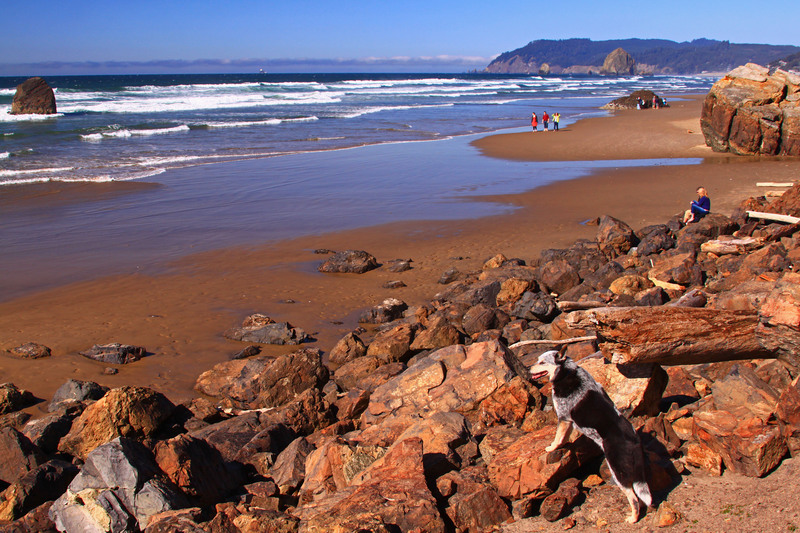 The Northern Oregon coast usually enjoys an Indian summer, which calls for sun soaked days and limited wind. The sun is also pretty intense, which also creates an amazing sunset with an explosion of red, orange and yellow colors as the particulates in the horizon dance with the sunset. This particular photo was taken just as the sun was setting at about 7:00 pm and the tide was going out. You can see the divets in the sand due to the tide quickly retreating out to sea. This creates an awesome photo opportunity. However, you have to keep a good lookout for any unwanted debris floating or lingering in the sand due to the amount of stuff that can be left behind by the fast moving tide. I normally just avoid any photo that has any debris in the photo or at least I end up cropping them out once I get home and upload them on my PC. I made sure to use my tripod, bubble level and remote switch in order to avoid any camera shake or blur. This is especially true since I had the camera in shutter priority and opened the shutter for 2.5 seconds. I took this shot just as the sun was setting but kept it out of the photo since it was too far to the right of the frame and I didn’t want too much empty space between the rocks and the sunset. The glare was also very intense so I reduced the white balance to -0.3 and attached my ND4, warming filter and my CIR-PL. [/caption] Hawaii like conditions along the Northern Oregon Coast with 82 degree temperatures, perfect swells and no wind! Not only was it warm for the entire part of the day but there was no wind at all and the water was as glassy and inviting as a tropical beach. September is usually the best time to visit the Oregon Coast since it’s normally experiencing an Indian Summer with sun baked days, dry weather and perfect swells. The sun also sets two hours earlier than during the summer so you don’t have to wait up all night to watch the sunset. I can honestly say that yesterday, 9/14/12, was one of the warmest days ever recorded at Cannon Beach as well as the most perfect beach day ever. Even the swells gave the impression that the Oregon Coast was welcoming a new tropical beginning with nothing but tropical weather here on out. However, reality struck when the temperatures dipped well into the upper 50’s as I stand along the beach waiting for the sun to set. I took this particular shot while standing on the viewpoint platform at Ecola State Park. It was about 6:00pm and the sun was at about a 90 degree angle with the sun in the far right. I made sure to use my tripod, bubble level and remote switch to avoid any chances of having camera blur since I attached my CIR-PL in order to eliminate too much glare from the water and sky. The viewing platform is about 200 feet above the beach so I set the FL at 23mm so I could get a good panoramic view. I also set the ISO at 100 and the white balance at -0.7 in order to avoid too much over exposure. The aperture was set at F-5.6 and the shutter speed as at 1/99 second. There are probably another 2 to 4 weeks of great opportunities along the Oregon Coast since September and October offer great sunset opportunities and the weather can be mostly dry. 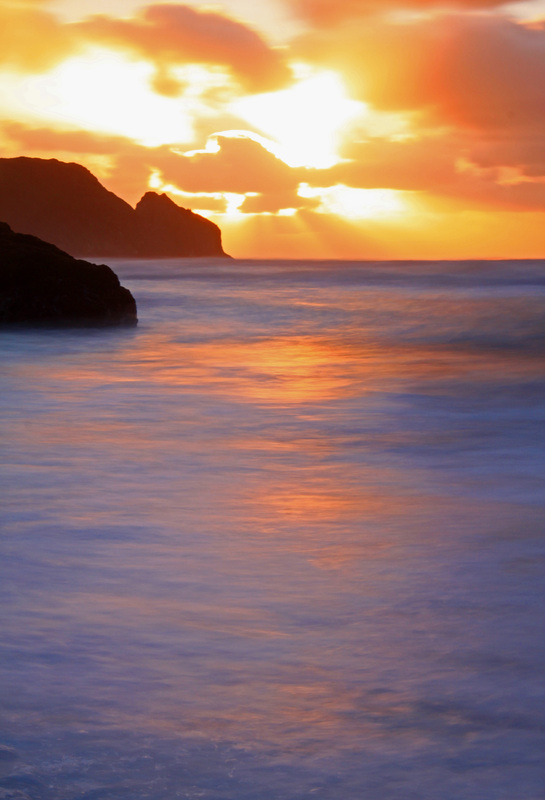 [/caption] Summer is usually the best time to witness an awesome sunset along the Oregon coast. However, sometimes a cloud front moves in very unexpectedly and causes photographers to panic and scrambling for ways to take advantage of on otherwise wasted sunset opportunity. This is exactly what happened last weekend in Cannon Beach. The entire day was sunny without a single cloud in the sky but eventually a large cloud bank had built near the horizon out in the middle of the Pacific Ocean. I knew that I was in trouble so I decided to try to take advantage of the extremely low tide that created many of the rocks to become exposed that are otherwise completely submerged even during most low tides. However, I was really impressed with the photos that I was able to get of the Needles much farther out. I was able to get into a position that is almost impossible and was able to take this shot. I was impressed with the exposure since Haystack rock, which was just feet from me, was completely blocking out the sun but the Needles were glowing from the intense sun glare. The photo was taken at about 8:15pm and the sunset wasn’t until 9:15pm. However, the shade from Haystack rock allowed me to switch the camera mode to shutter priority and set the shutter speed to 3.2 seconds. You can see the froth and ghosting effect from the waves crashing into the rocks in the lower right part of the photo. I made sure to use my tripod, bubble level and remote switch and also turned off the OS in order to eliminate any camera shake or blur. I also attached my warming filter, ND4 and CIR-PL. I set the ISO at 100 and the white balance at -2 which caused the aperture to automatically set at F-28. I was using my Sigma 17-70mm lens and set the focal length at 46mm in order to frame the rocks as close as possible to the edge of the photo. I was fortunate that there weren’t any blurry sea birds in this shot since there are usually dozens of sea birds flying around and near the rocks. If you look closely, you can see several of them resting on the rocks. [/caption] A view of the Needles in silhouette, well after sunset, offers a rare cobalt blue view of the beach and sky. A great way to get a very interesting and magical photo along the Pacific Coast is to wait at least 1 hour after the sun has set and then set your shutter priority at around 10-30 seconds and photograph the ghosting of the tide and capture the cobalt colors created in the beach and sky. As long as the horizon isn’t completely obscured by an approaching front you will be able to take advantage of the brilliant colors. This is only one of several that I took but it shows several cool features. You can see the ripples in the sand from the receding tide, the blue colors in the sand and sky, the silhouette of the rocks and the ghosting effect of the water. To get this shot I made sure to use my tripod, bubble level and remote switch in order to avoid any camera shake or blur. I made sure to turn off the IS on my Sigma 17-70mm lens and set the focal length at 32mm. This photo was taken at around 9:30pm which was about an hour after sunset and that’s about how long it takes for the cobalt blues to come out. I removed my ND and CIR-PL filters since it was pretty dark and there wasn’t much brightness left. However, I did attach my warming filter and set the ISO at 100 and the white balance at -0.3. I set the shutter speed at 15 second and since I had the camera mode in shutter priority the aperture was automatically set at F-9. [/caption] The trail that starts near the Devil’s Cauldron takes you to the summit of Neahkanie mountain and offers you great views of the Pacific Ocean. 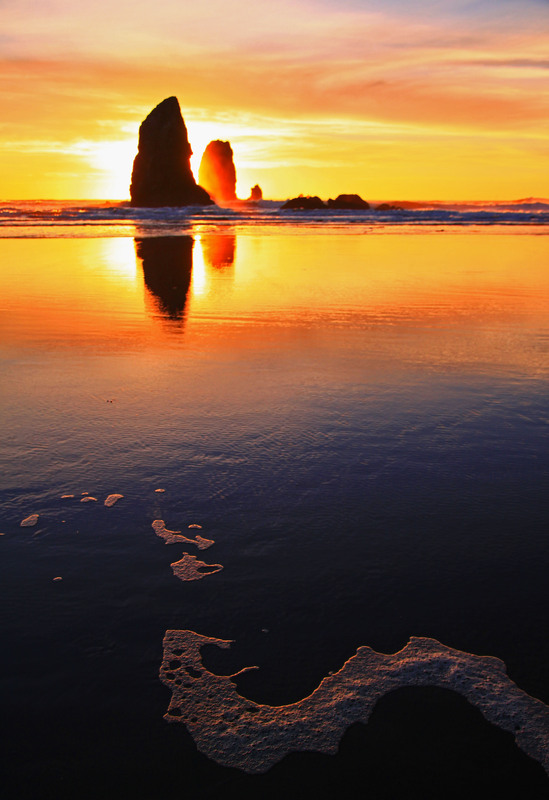 [/caption] Here is another photo of a beautiful sunset at Cannon Beach, Oregon. I was able to get so many awesome sunset shots last Saturday that I am going to post as many as I can. The colors were absolutely amazing, as you can see and the sky was lit up with every radiation color the sun could muster. I was using my Canon T1i and my Sigma 17-70mm lens and I made sure to use my tripod, bubble level and remote switch. The sun had literally just set below the horizon when I took this photo. The amazing explosion of orange and yellows are almost too much to comprehend. I wanted to get as much of the horizon as possible so I increased the telephoto to 70mm and set the ISO to 100 and the white balance at 0. I had the camera mode in TV and set the shutter speed at 2.5 seconds as well as attached my ND4, CIR-PL and warming filter. This caused the aperture to be automatically set at F-22 due to the low light and the filters on the lens. Haystack rock is visible on the right and the swells were just heading back out to sea when I snapped this photo.